Kim Kardashian and Kanye West arrived in Paris, France over the weekend, where they attracted attention while lunching at the city's Chez Ferdi restaurant on Sunday, April 13, and strolled the Paris streets on Monday, April 14. Kim, 33, and Kanye, 36, are set to wed on May 24 in the City Of Light. 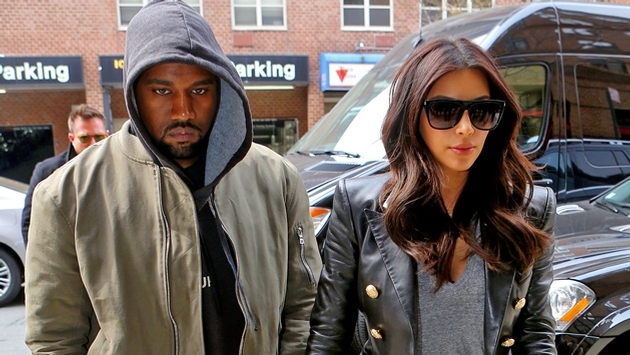 Expected to be a multiday event, Kimye's upcoming nuptials have been in the works for months. Recent rumors insinuate that Beyonce and Jay Z will attend. Plus, the former Destiny's Child frontwoman will allegedly serve as one of Kim's bridesmaids. Kim and Kanye reportedly toured the Château de Louveciennes during their trip, potentially scouting the venue as a possible wedding location. The chateau should provide enough room and privacy for the anticipated 150 guests, People reports. According to one observer, Kim "smiled and shook hands for a long time when she was leaving. She seemed very pleased." And while the couple was in France to continue planning their wedding, they managed to squeeze in some time for a shopping spree. Kanye was seen leaving the Balmain store, carrying multiple stuffed shopping bags, according to Us Weekly. Furthermore, Kim may have picked up some new threads as she pulled off an outfit change midday on Monday. She rocked two different Balmain dresses: one navy blue number from the Fall 2012 collection, and a black velvet piece from the same collection. What do you think of Kim and Kanye getting married at the Château de Louveciennes?